Use our SiriusXM coupons and promo codes to get the cheapest deals on satellite radio. Take advantage of special offers, such as a free satellite radio with subscription, discount reconditioned radios, or special discount promotional rates. Check back often, as deals change with availability of promotions. 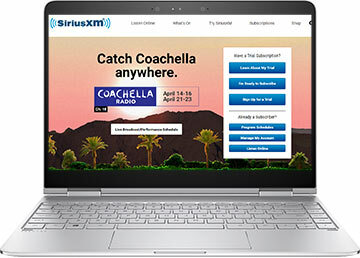 To buy a satellite radio online, hop on over to shop.siriusxm.com. There you can compare the newest radios including Onyx, Stratus, and Starmate models, research the details, and make your purchase. There are plenty of options to allow you to take satellite radio with you wherever you go—at home, at work, in your car, or just about anywhere. They are also the source for a wide variety of useful accessories, such as docking kits for your vehicle, FM direct adapters, antennas, and second vehicle kits. Plus they have all the parts you could need for your satellite radio: cables, mounts, antennas, batteries, and power adapters.